Prince Sparhawk is pledged to fight the enemies of the Tamul Emperor Sarabian with all the skill and cunning of a Pandion Knight. Meanwhile his Queen, Ehlana, educates Sarabian in the art of ruthless statesmanship. Sarabian is transformed from a mere puppet ruler into a formidable politician. But still Trolls, vampires, werewolves, zombies, ghouls and Ogres form a vast conspiracy to take over the Empire. Most disturbing of all are reported sightings of Shining Ones amongst the hordes. These luminous beings inspire more fear than the rest combined. 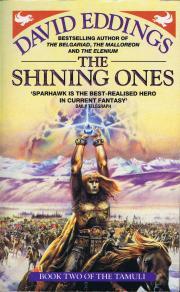 And Sparhawk and his companions must resurrect the sacred jewel of the Troll-Gods to combat them. The second book in The Tamuli beginds to unveil the hidden powers at work for both good and evil. 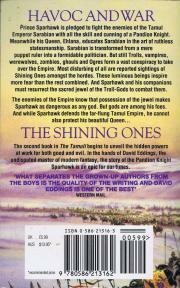 In the hands of David Eddings, the undisputed master of modern fantasy, the story of the Pandion Knight Sparhawk is an epic for our times.